If you see a missed call on your phone today, most likely it means you weren’t available when someone called. In India, however, a missed call might mean something completely different. Instead of sending a text message, or spending time on the phone — both of which cost money — a simple missed call notification might mean your friend is on the way over, or that you should hurry because the soccer game is about to start. Jugaad is not only a Hindi word, it’s a way of life for many people of the region. Defined as, “an innovative fix, or an improvised solution born from ingenuity and cleverness,” it applies in many ways. Quite simply, the attitude describes the entrepreneurial spirit that is practiced by millions in India simply to improvise clever solutions to everyday problems. This sprit is now applied in its own methodology for innovation by many around the globe called Jugaad Innovation. Because developing nations don’t always have the same money to spend on technological solutions, business leaders have to be frugal. In Kenya, many would benefit from the service Waze because an estimated $600,000 in productivity is lost every day to traffic that would make Los Angeles blush. Because only 15% of people in Nairobi own a smartphone, though, government officials has to get frugal. Enter Twende Twende (which means “let’s go” in Swahili), which uses SMS for drivers to communicate traffic jams and alert others in the city to take alternative routes. 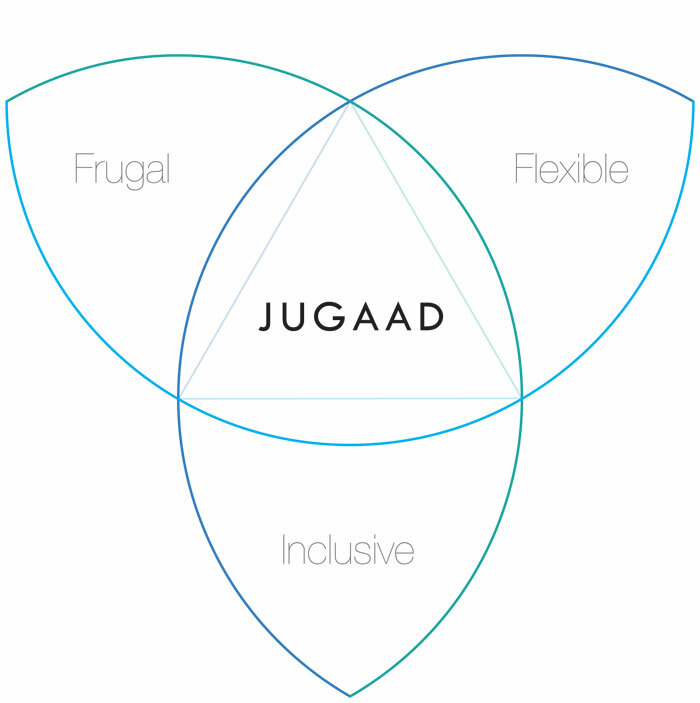 When you find the perfect mixture of inclusion, flexibility and frugality, jugaad can be found. So, what can we in the West learn from this lean way of innovating? Most of you have heard of Jeff Bezos’ two-pizza teams by now. We’ve read the science behind it, and it’s treated as such gospel that nobody seems to bother anymore. We see the benefit of communication and innovation, and the measure appeals to our common sense. What if we could slightly tweak this approach to see small teams as the most frugal way to accomplish our business goals? 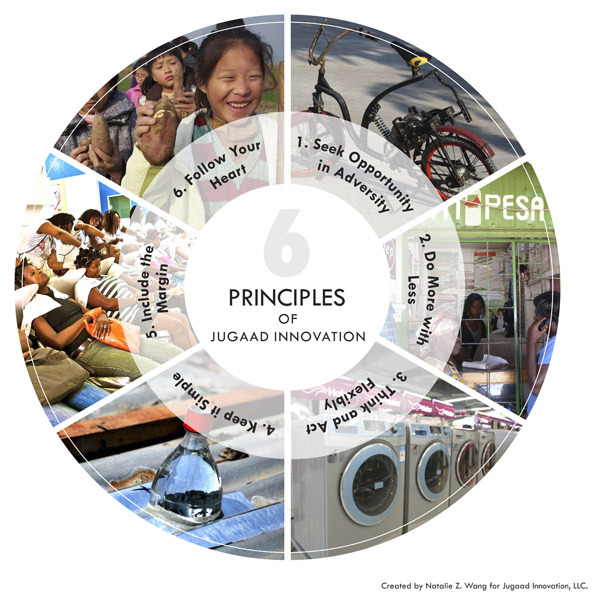 The six principles of Jugaad Innovation (found in the image below) can be described as an extension of the word itself. Teams work to do more with less, keep things simple and keep in mind things like the margin. The principle that stuck out the most to me was to seek opportunity in adversity. We can all identify with that in our teams. Having smaller teams forces me to eschew all the bells and whistles and get as lean as I possibly can. Tools and processes tend to break down when you have to get a ton done with a few people. Teams working under adverse conditions strip away all the pomp and circumstance and be really honest with each other. In their book, authors Navi Radjou, Jaideep Prabhu and Simone Ahuja describe how large enterprise organizations in the West have become too big. Teams bloat to meet timelines and stakeholder demands. At times, they argue, this stifles innovation because people aren’t forced to keep things simple and flexible. Lean Startup has helped change some of that conversation, because of the success of these hungry teams. That’s why I think we would do well to serve our teams by adding a little adversity to every product discussion. Tell stakeholders “No”. I’ve never had anyone argue with me on the benefits of that two letter word, but so often we don’t have a desire to say it. It’s so challenging that people are writing books about the subject. Some might argue that saying “Yes” to every request will add tons of adversity to a project, but I don’t think it’s the right kind. Weighty backlogs can pull morale down, and rack up debt faster than you can say “waterfall”. Instead, we should look to the benefits of lightweight releases. “No” also allows you to work with the right amount of team members. There’s no greater example of two-pizza team communication than a large morning scrum. Backlog items can be lost in the shuffle, and platforms end up shipping out of sync. What’s our core mission we are fulfilling? Even the apps we build at Bottle Rocket are getting ginormous, so the days of single use apps are seemingly numbered. Yet in emerging markets and industry segments, it’s almost imperative that we keep things simple for product releases. Doing more with less accomplishes a few things. Ideas that actually make it into the release can still hold water after having holes shot through them. Features have more of a fit and finish to them that also deepen the user’s experience. Finally, team members are more invested because they all have a crucial role in the creation of the work. Will this adverse condition always create the best features? Probably not, as evidenced by the amount of failure in the startup community. In the end, the probability of success raises when lean minds produce quality work. Being more commitment conscious. We ask our teams to look at the sprint backlog and “buy into” the work for the coming sprint. Many of my experienced agilists will point to larger teams with dictated goals as some of the most unengaged co-workers imaginable. They either have no choice in their backlog, or the ability to understand what they are committing to. We must be more conscious of what is being asked of us and make better decisions based upon that understanding. That is the fundamental benefit of adversity-based environments. We think about things like the margin (so to speak), and in the end we follow our hearts. Teams that are conscious of what they agree to see work holistically. Their eyes are open as they write and design new features, and work with their timelines and deliverables in mind. They are also unafraid to speak up when a decision will contradict with technical and quality standards. I need to read a little more before giving Jugaad Innovation deeper consideration, but I can say I’m intrigued by the idea of adding frugality to my mantras for teams. If you see opportunities in adversity and build the right environment around those motivated individuals, some amazing solutions are bound to arise.